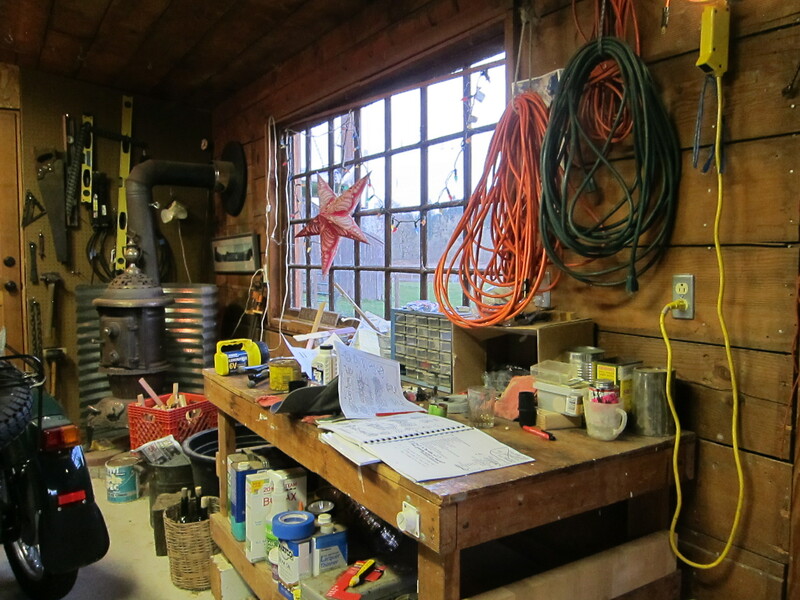 A few Saturdays ago, sometime before my weekends were consumed in the garage, cleaning up 88 years of dust and left over bits of projects from the owners my house has had since 1925 when it was built, I realized I needed a can of chain lube. 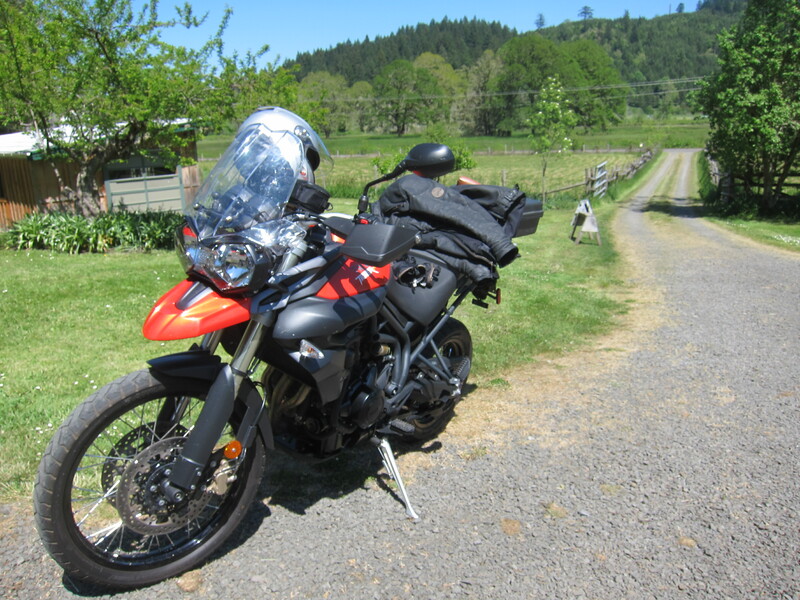 I got the Tiger ready and went on the business of searching for a can of chain lube. One thing led to another and when I came to my senses I was on Wolf Creek road, some 20 miles off course. I know this happens to you, to some more than to others, when the motorcycle is the one taking you along for the ride. Eventually I came back down to the valley floor and went past John’s house in Crow and saw familiar cars in their driveway. I thought about stopping by, but continued on, and then I thought some more and turned around. Good thing I did. Like I always say, I usually get more from a human connection than I can offer. I’m enriched by others’ energy in a very selfish way. And this was the case for this brief encounter with John and Kathleen and their friends who were there for the ladies monthly get together. They range in age from mid 50’s, I would suppose, to mid 70’s dare I say, with a contaminating energy and zest for life, which I believe is catalyzed, a mutual soul feeding experience, when they get together. There is always something to learn from someone who went farther ahead on the road of adventure than I have been. And I enjoy John and Kathleen’s cozy home and grounds that match who they are, where the buildings, the decoration and the location itself add context to their stories. 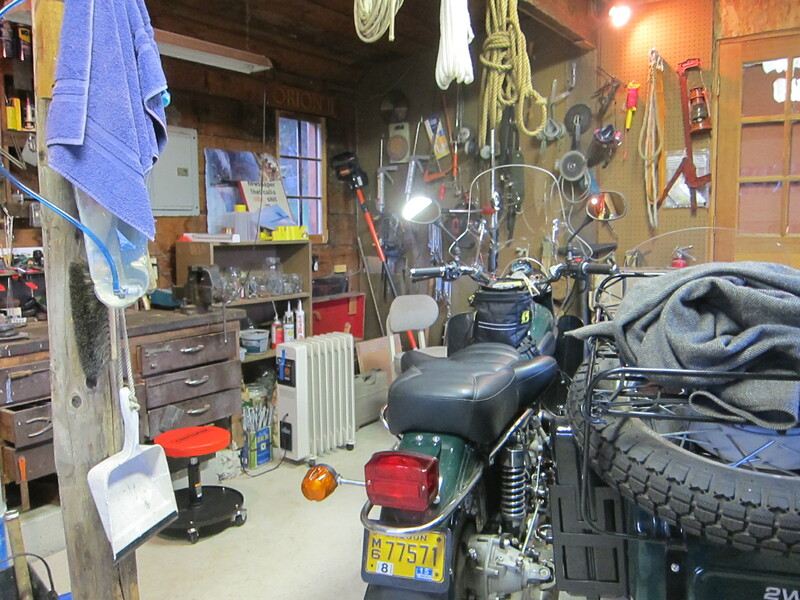 Of course, of all buildings, I pay close attention to the motorcycle shed, but definitely not only to that. 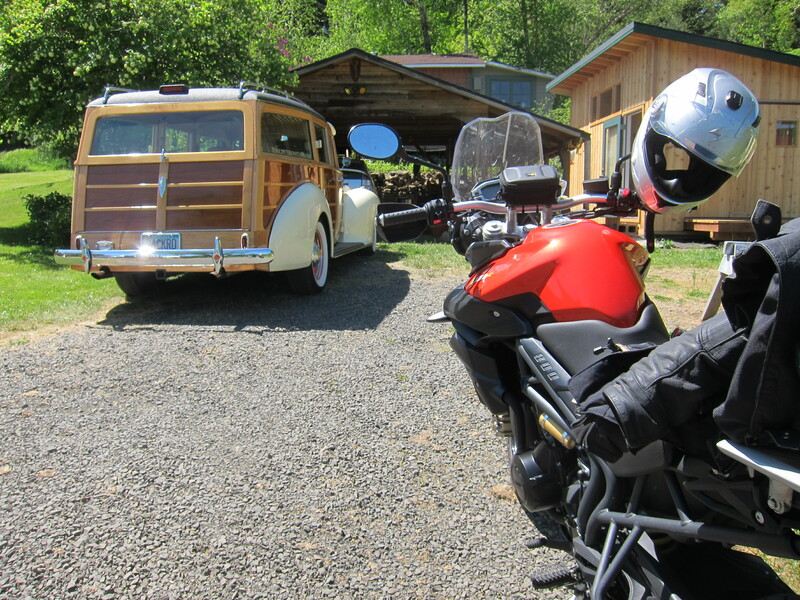 People were still arriving for their get together, as I briefly spent time with John, still in their driveway, catching up, visiting a just completed new building in their property (which he thought would be a good place for his Ural motorcycle, but instead became a nice studio), when Tenold, one of their friends, arrived in style in a beautifully renovated and very tastefully customized Packard. Tenold explained to me the car is either a 1939 or 1940 Packard. 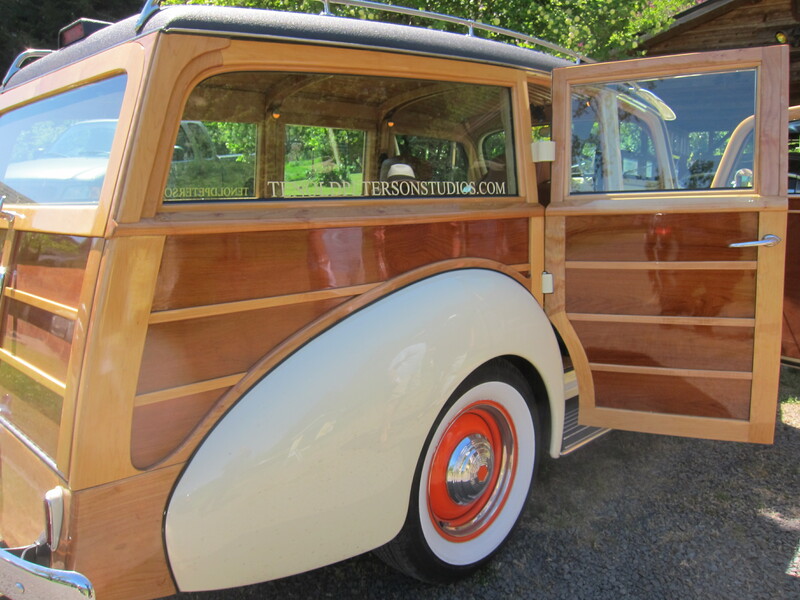 Originally a sedan, Tenold “sculpted” it into a woody. The work and craftsmanship put on this project resulted in a phenomenal car, smoothly connecting two very distinct ideas. Tenold’s smooth creation kept important elements of the car’s origins visible and prominent. 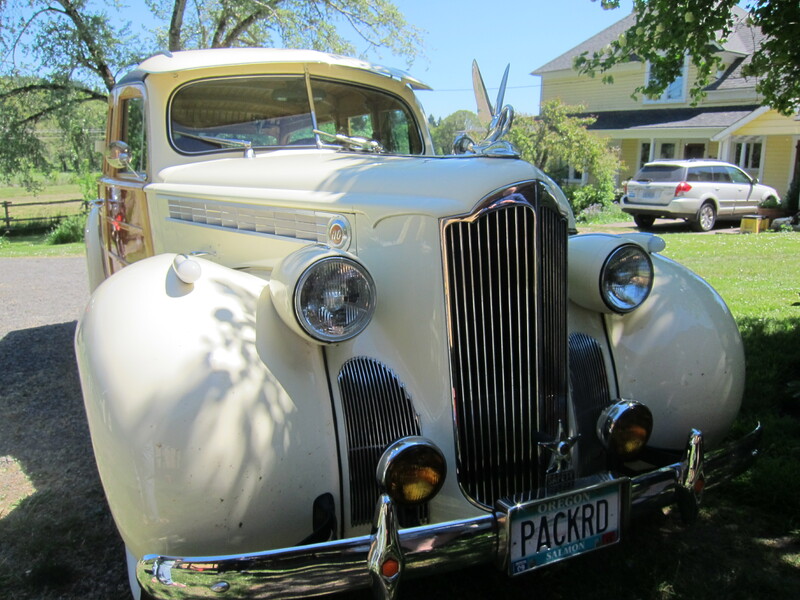 The front of the Packard, subtle modifications. It has the amenities of today’s cars, heated seats for those cold winter days, and air-conditioning for the summer, without compromising some details. He tastefully maintained, highlighted or slightly modified the beautiful designs of a time past. 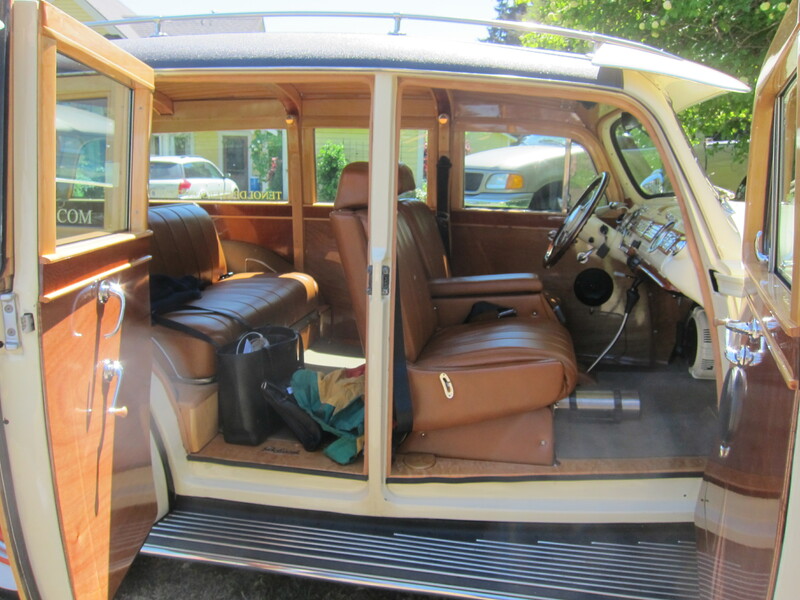 Making an old car a daily driver with modern amenities is a balance that is difficult to obtain. 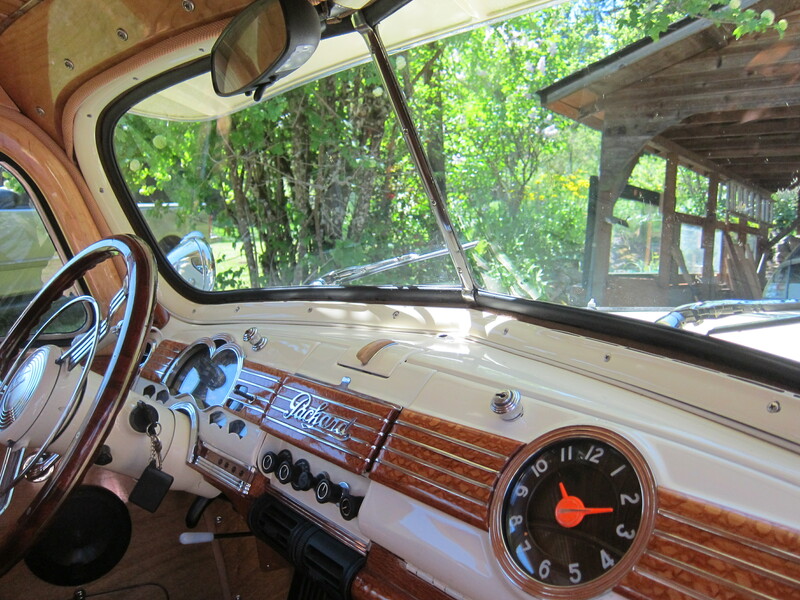 Detail of the car’s interior. Nice woodwork. Many guys in the hot rod world have gone past the sweet spot and created aberrations, cars where critical details were chopped and unceremoniously smoothed out or deleted. Those details are what take my imagination to the drawing board of the car industry of those days, what they had in mind, how those cars were designed, what was the concept of luxury on those days. That is what makes those cars interesting in my opinion. You would think the hood ornament was original. But it is not. In my humble opinion, some of those who are called professional custom builders can’t hold a candle to Tenold’s creation. Nice detail of the interior. Love the way the doors open. The car also has the engine of a recent Corvette. 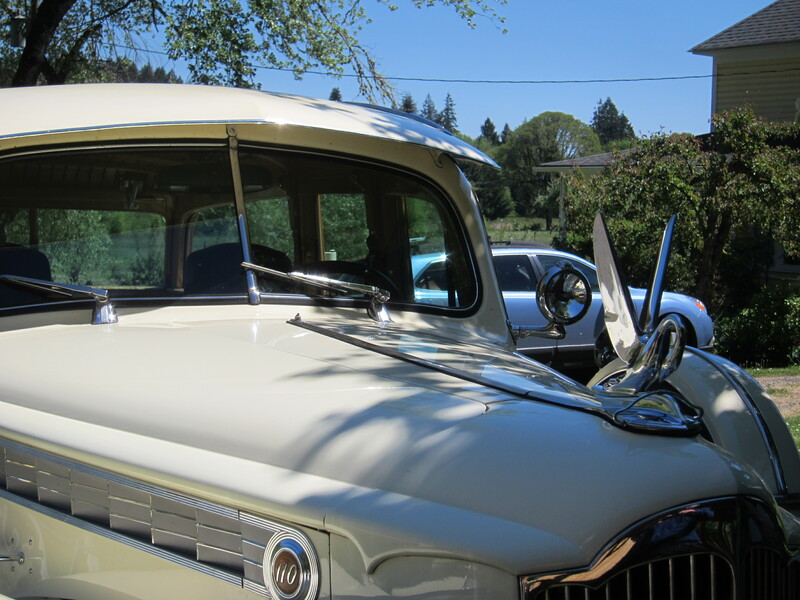 In the end, it is more than a daily driver, it is a fun car as well and Tenold and his wife use it as transportation, going on interstate trips with it. If you want to know more about Tenold and his nice art work, take a small tour of the Tenold Peterson studio. I did not stay there for lunch, it was just a great short visit with John, Kathleen and their friends. Soon I was on my way back home energized enough. And yes, I did get a can of chain lube. 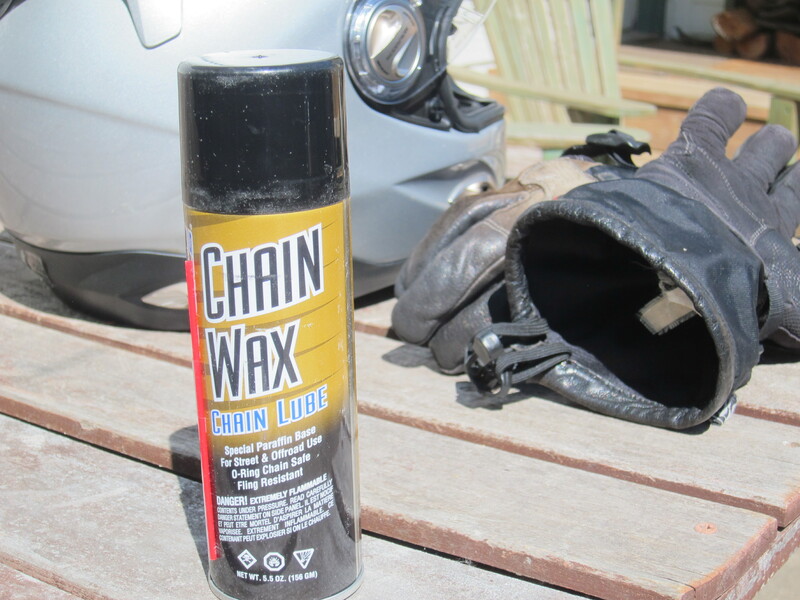 I don’t know if this stuff, chain wax, is really good or better than the lithium based lube I have used in the past. So I bought a small, portable can to test it. 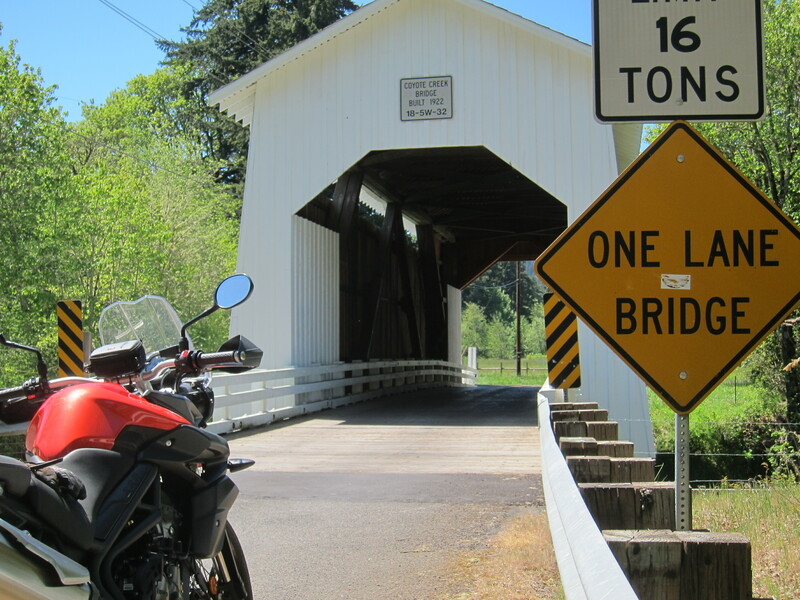 Next posts: Remembering a great friend and a couple of nice rides, including a test ride of Ducati’s Diavel Strada. 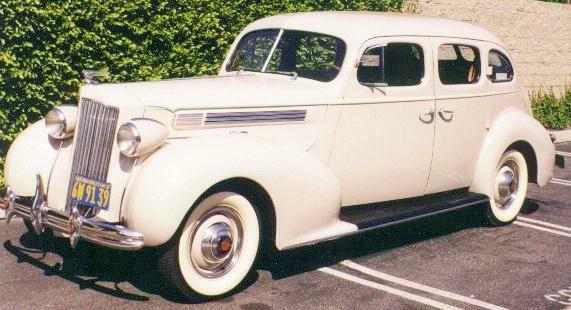 This entry was posted in Riding the Triumph, The Book and tagged Packard, Packard 1939. Bookmark the permalink. That Packard is gorgeous. 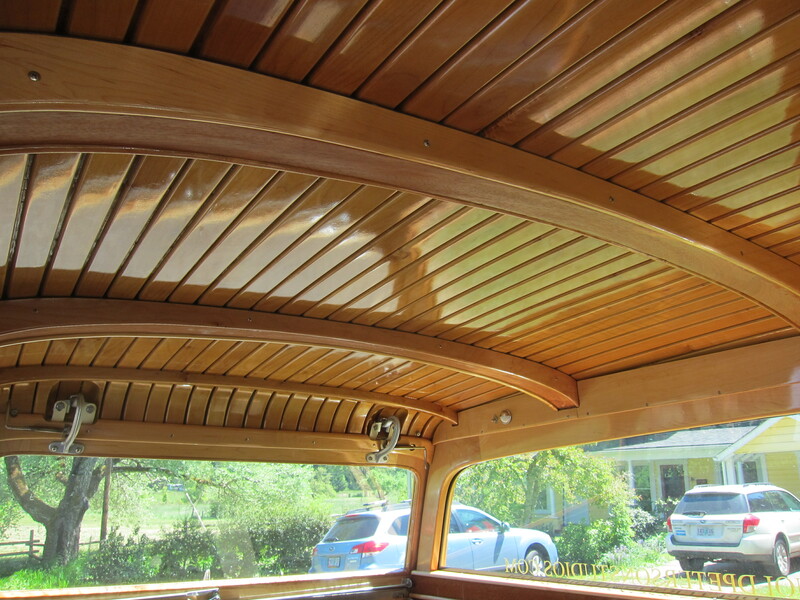 Beautiful wood in the interior headliner. And heated seats. Who would have thunk it would have heated seats. Simply beautiful. And that Tiger’s not bad either, lol.